Carrot spirals are so pretty! I was rummaging through the fridge this morning, looking for something to make into a salad for work lunches, and although I have a lot of carrots, I wasn’t finding them particularly inspiring… They do however, go very nicely with beetroot, celery and mint so the basis of a delicious salad was there. And then I remembered that Alex has a spiraliser! So I hot-footed it over to his house clutching my carrots and borrowed it. 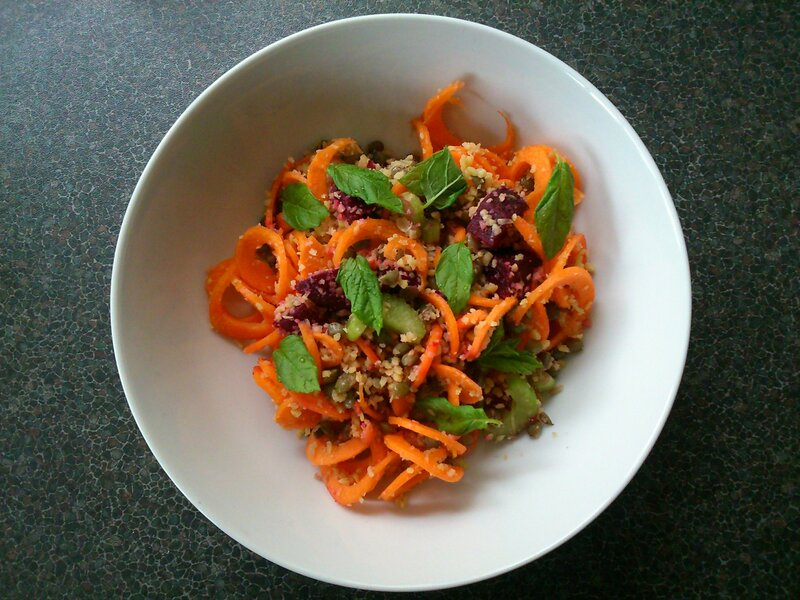 And combined with a base of gluten free couscous and green lentils, the resulting carrot spirals and other vegetables have made a very appealing dish! Bring the stock to a simmer in a small saucepan, and add the lentils. Cook for around 15 minutes until tender. Drain the lentils, saving the stock. In a bowl, add 150 ml of the stock (hot) to the couscous, mix well and then cover the bowl with cling film to keep the steam in. Leave for around 10 minutes, for the cous cous to absorb the liquid. Add the lentils to the couscous, along with the lemon zest, lemon juice, and salt and pepper to taste. Mix well. Toss the carrots, beetroot, celery and mint through the lentil mixture.